Cox, a first team Class 7A All-State selection at McGill-Toolen High School in Mobile (Ala.), finished 2018 with 42 solo tackles and 14 assists for the McGill-Toolen Yellow Jackets. Cox, who played in the Mississippi-Alabama All-Star Classic, also notched eight tackles for loss and five sacks. 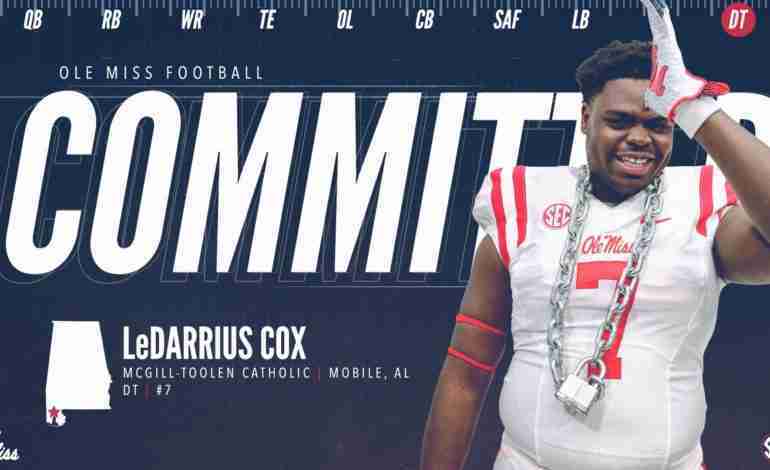 Rivals’ Chad Simmons spoke with Cox on his reasons for committing to the Rebels. “At Ole Miss, they need guys like me,” said Cox. Cox is a top-20 prospect in Alabama, who had committed to Tennessee in April. Though he was listed as a Vols’ commit, many expected him to flip to Auburn. But at the end of the day, it was the Rebels who made Cox feel at home.